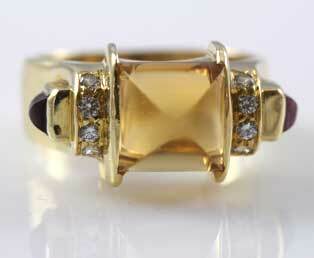 This outstanding estate ring has a golden, sunrise citrine center. This ring was designed by Chris Correia and has her designer mark and copyright symbol. The deep golden citrine is a rectangular shaped, cabochon cut to rise to a rounded center point. It is bordered by two vertical rows of clear, white diamonds. There are two square, deep purple tanzanite cabochons on each side of the setting. All set in 18KT gold with a wide shank. Citrine: measures : W7.95 x H9.44 x D5.6mm. Color: Dark Golden Sunrise. Cut: rectangle cabochon that moves to a center point. Clarity: Very clear. Diamonds: Eight brilliant-cut, Color: J-K. Clarity: VS2. Size: 1.84mm.